We strive to create a humanistic, relationship-based process with a focus on problem-solving and community living in order to foster development of insight, identity, & interdependence. New Summit Academy approaches the therapeutic component of our program from a humanistic, strengths-based paradigm. We do not create "treatment plans" but rather "goal plans." Since 2005, we've been using the term “personal growth” rather than "therapy" to highlight the fact that every human being is in a life-long process of integrative growth, no matter what age we are or where we are in our lives. Students at NSA do not need to be “fixed,” but rather need a different environment, appropriate challenges, and more support to grow and develop a growth mindset. We aim to focus on nurturing and empowering our students' strengths and resilience rather than to focus on only diminishing negative symptoms. As a greenhouse serves plants, NSA attempts to provide the kind of nurturing environment, process-based structure, supportive immersion guidance, and the enrichment experiences where optimal growth can be achieved and resilience can be built as young men develop and mature. The strengths that are enhanced prepare our students to take their next steps with many skills and a solid sense of identity to take on their adulthood challenges and enjoy their successes. The therapeutic components of NSA stem not only from the experiences we offer, but also from the relationships that are built between students and other students and staff. We believe in our students and their ability to grow. We relate to and nurture students by seeing, hearing, and feeling what our students need us to see, hear and feel. We empower and guide students to take ownership of and accountability in their own lives. We respond to students and "meet them where they are" to acknowledge their own individualized process. We spend time with students outside of offices and classrooms, getting to know them at many different levels and in many different contexts. NSA's Approach: We Individualize and Integrate Through Our Unique "Supportive Immersion"
After a decade of success and repeated questions of how we do what we do so well, our team created the term Supportive Immersion to describe our unique approach to nurturing, empowering and guiding our students and families on their journeys of integrative growth. The three pillars of Supportive Immersion are: 1) Empathic Connecting, 2) Collaborative Empowerment, and 3) Process-Based Scaffolding. Our therapeutic professionals work evenings and weekends, recreation and Aventuras, as well as student life activities so that there is a strong sense of relationship, trust, and advocacy for each individual student. The breadth and depth of experiences in which therapists participate with students allows the therapeutic team to truly "know" and "see" a unique being in each of our students. Students and staff cooperatively empower each other to journey to higher levels of integrative growth together. Thanks to these relationships, therapists use their knowledge, skills, and experience to create a truly individualized and integrative approach to growth for each person. A scaffolded structure for goal-setting and continuous progress helps students break down longer term goals into shorter term successes. 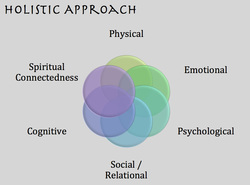 Therapists choose techniques, approaches and interventions that not only fit NSA's belief system but also cater to a student's unique strengths, challenges, and learning styles. Goal Plans are regularly revised, assessed and updated to provide the most fluid and responsive approach to growth and development so that students are continuously challenged appropriately and growing in a meaningful way. Thanks to living in Costa Rica, cultural immersion is an inherent benefit and facilitator of growth. But this does not mean we do not take extra care to intentionally provide another type of "cultural immersion" experience for our students - our milieu. Staff and students participate in a variety of integrated activities together to develop relationships that are built within different contexts of connectedness, creating bonds that are truly authentic and multi-dimensional. ​The NSA program structure provides activities and experiences that address the physical, emotional, psychological, relational, cognitive, and spiritual connectedness needs of our students in a very integrative way. These aspects of our growth are not compartmentalized or separate. NSA's structure and process is very intentionally designed to promote the experiential, integrated development of physical, emotional, psychological, social, cognitive and spiritual resources. Furthermore, NSA staff and peers help students develop these resources in a way that brings consciousness to one's own way of continuously growing and learning.